The heat lamp proved, umm, too hot in my brooder experiment. I had this weekend all planned out. 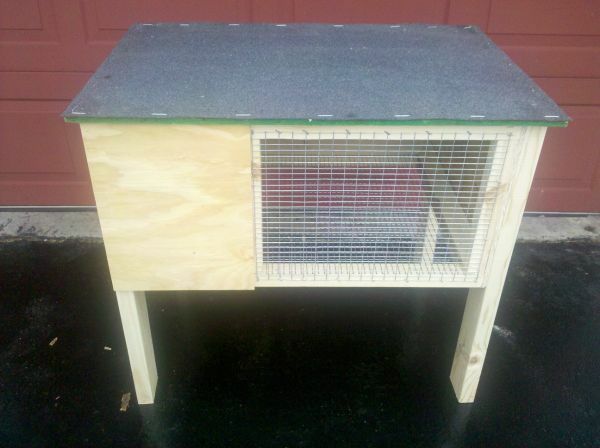 I planned to team up with Matt to build a brooder for the chicks. This is a box where the chicks can grow up safely and warmly inside the house, until they are strong enough to live outside. Earlier in the week I had even sketched a rough design for the brooder I wanted. It’s good to set goals, right? 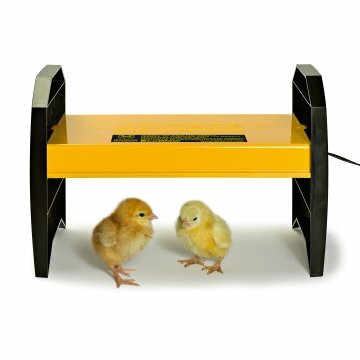 Before we could build the brooder, I needed to figure out the temperature of the heat lamp. Chicks need constant access to heat as they grow. The first week temperatures should be at 95 degrees, then it should drop by 5 degrees each week thereafter. I designed a brooder box that would stand 2 feet tall, and needed to figure out if I could hang the heat lamp at that height and maintain a 95-degree temperature. 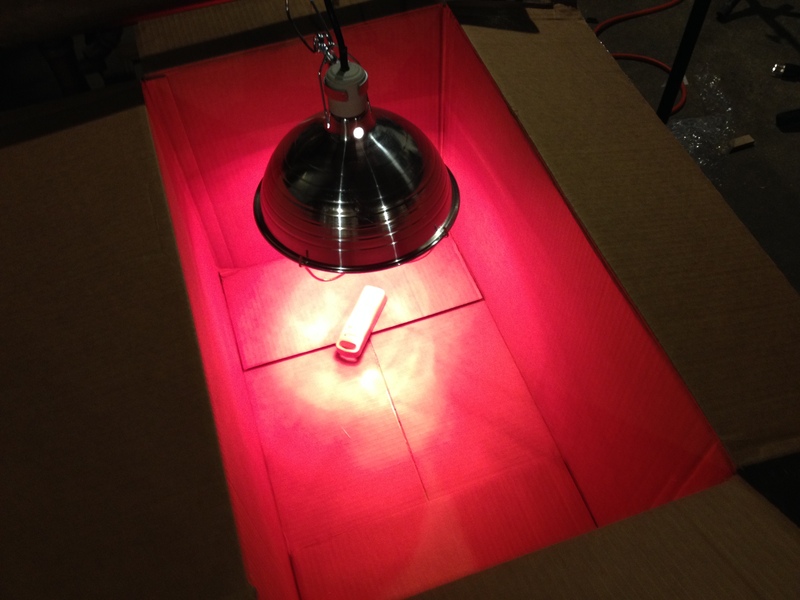 To conduct this experiment I used a large cardboard box to act as the brooder, and I attached the heat lamp clamp to a table so the bulb pointed directly into the box. I measured 13 inches from the light to the floor. Within three minutes, it was 97 degrees in the box. Two minutes later it shot over 100 degrees. Clearly, I needed to raise the lamp. I held the lamp at 24 inches, and presto! It maintained a 95-degree temperature. I celebrated, and ran upstairs to tell Matt the good news. By the next morning, we both felt uneasy. The heat from the lamp is intense, and I didn’t have an absolute secure method of clipping the lamp to the brooder. We considered suspending the lamp from a chain attached to the ceiling, but the idea didn’t sit well. Matt and I worried about possibly burning our house down, especially since we will have to leave the brooder unattended while we are away at work. The Brinsea EcoGlow 20 Chick Brooder is a safe heating alternative that hopefully will solve our dilemma. It didn’t take long for us to abandon our heat lamp. After I ordered the EcoGlow, Matt and tried to figure out how much wood we would need to build the brooder. Then, suddenly, Matt got quiet. He typed furiously into his laptop, then handed it my way. “How about if we get something like this?” he asked. The photo was of a rabbit hutch, for sale on Craigslist. I checked the dimensions. It met all the requirements. “Let’s do it!” I told him, relieved for once we wouldn’t have to drive out for lumber. The great thing about the hutch is that once the chicks are big enough to go outside, we can reuse it as a timeout spot for unruly or sick birds. We’ll just lug it out from the basement and put it by the coop in the yard. We pick up the hutch tomorrow afternoon. The first three of a gazillion sand bags to fill the run. In other coop-related news, the coop is relatively under water since the weather warm-up. Now that the ground has settled from the chicken coop construction, the ground inside of the foundation had dropped a bit and freely collects water. Our hope is to build up the ground with sand, which we planned on using anyway in the run area. So today we went on the first of many sand runs. 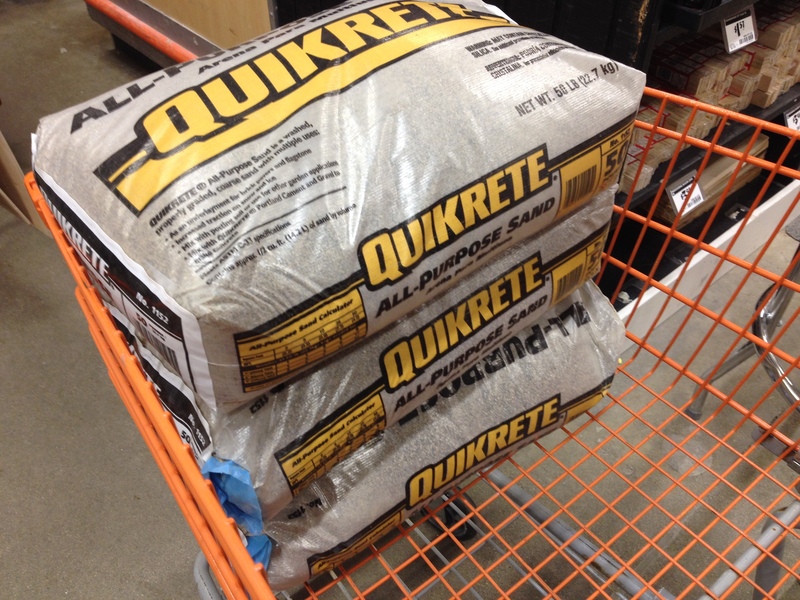 We bought three bags of all-purpose sand. The texture seemed right, and had plenty of small pebbles that could be used as grit. From my calculations, I have a gazillion trips left for the remaining sand. I may have started this weekend with specific plans in mind, but it’s funny how things can just spin out of control. And still end up exactly as I had hoped. ← It’s how cold in the coop? I feel your pain with the flooding issue. We spent much of the day addressing melting snow/flooding in the basement and around the coops too. No fun! I love your posts. You know, water always wins. Would it be better to move your coop to higher ground? Thanks Mary! I really believe adding some sand will help the situation. The coop is built like fort knox, and I’m not sure moving is an easy option. It’s seriously not a terrible flooding situation, and I’m excited to see if the sand solved the issue! Cheers!